What is the perfect accessory for your new aftermarket wheels? Lug nuts of course! Often the most overlooked accessory for truck owners with new wheels and one of the most important. That's why we are now offering Lug Nut Kits from West Coast Wheel Accessories, to make sure your wheels are safely installed. The lug seat inside your wheel is specifically shaped to seat your lug nuts with the most surface contact possible and most aftermarket wheels have a different lug seat that factory wheels. Using the wrong style lug nut will not give you a proper seat and could cause your wheels to come loose, or worse, potentially causing damage to your wheels, vehicle and yourself. Keep yourself safe with properly installed wheels and accent your aftermarket wheels perfectly with West Coast Wheel Accessories spline drive lug nut install kits. 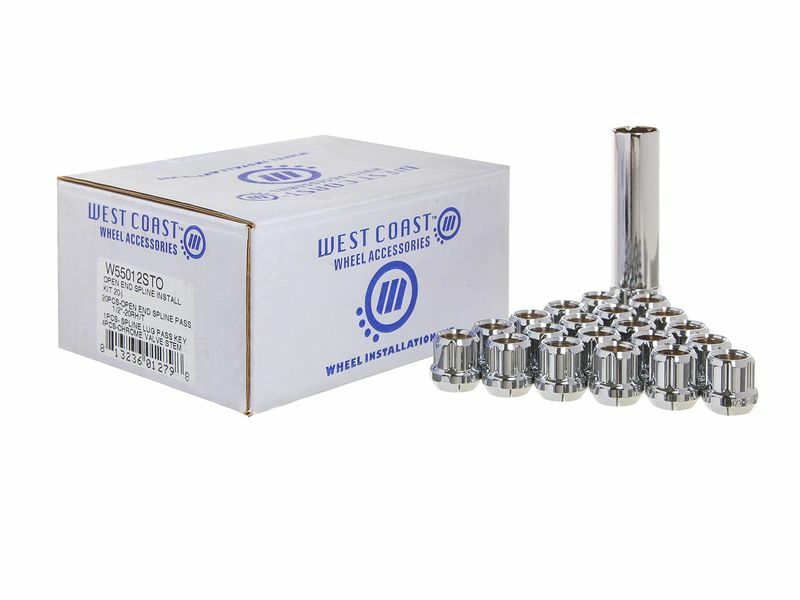 West Coast Wheel Accessories backs their Lug Nut kits with a 1 year limited warranty. Install only requires basic hand tools and a few minutes in the driveway. But, if you want to use legitimate power tools in a shop, we wont stop you.